We guarantee the lowest prices allowed on all Osaki, Titan, and Apex Massage Chairs. The 4D PRO Japan Massage Recliner is equipped with the highest caliber and latest in comfort technology. 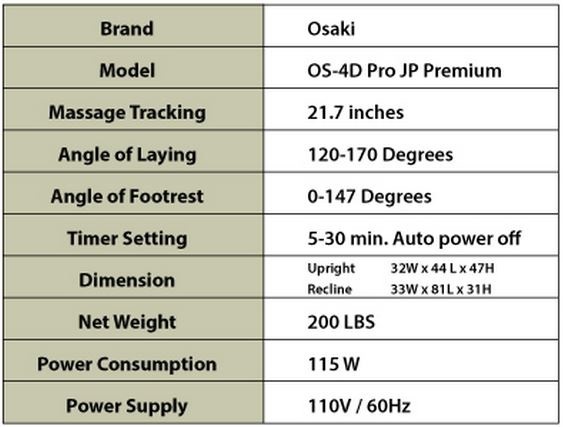 Let us ship and deliver your new Pro 4D Massage Chair by Osaki at no additional cost to you. That's right, you pay for your chair and we will deliver it for free. This is the #1 Massage Chair in Japan currently and we are confident it will be the #1 Massage Chair in the U.S. soon enough. All Osaki Brand Massage Chairs are dreamt up, designed, and engineered for maximum comfort and to provide the best massage possible. They are of the highest quality and undergo rigorous screening to ensure consistency and reliability. Come experience the Osaki difference! This specific model is equipped 4D Massage Technology Capability. This is the most life-like and realistic of all massage mechanism capabilities. There is raising, lowering, increases in pressure, decreases in pressure, side-to-side movement, zone targeting, depth and muscle penetration, and alternations in rhythm and timing. You will most likely think you are at the massage therapist's office when really you are relaxing with your feet up in your own home. Chronic pain conditions, aching backs, stress-relief, post-workout soreness... These are all conditions that can benefit from regular massage and you can experience immediate relief following a brief 10-15 minute session in an Osaki 4D PRO Massage Chair like this one. The Fourth Dimensional Aspect is also further elevated by Kiwami Mecha Kneading Ball Massaging Mechanisms. These feature steady, strong slow pressure movements followed by slightly lighter movements for stimulation, activation and release of tension and soreness. 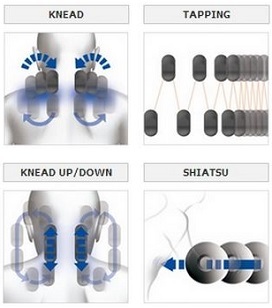 The rhythm changes and alternates to prevent desensitization from a constant, monotonous massaging force. This also keeps the body from acclimating as quickly to the massagers to enhance the therapeutic effects. You will instantly feel relief and notice that the movements are adjusting themselves from fast and staccato to slow and steady. This ensures you have a truly serene experience and can relax and unwind. The Deep Tissue Shiatsu Characteristics allow you to target dense, sore muscles and relieve the deepest aches that can actually contribute to soreness and pain elsewhere. These mechanisms can be adjusted and targeted to enhance your pain relief from conditions like stress, neuralgia, and general muscular discomfort. Target your shoulders with kneading or tapping styles, target your hips and lower back with a combination of air bag compression and kneading balls, you can even focus directly on the nape of your neck. This stimulates important spinal regions and increases blood flow to your neck and upper shoulder regions. The Computerized Body Scan ensures the massage chair and massaging mechanisms assess your body's unique type and shape to optimize the comfort and overall experience. This is a very standard feature on the top-of-the-line massage chairs. Since no two people are alike, every session begins with this brief function. 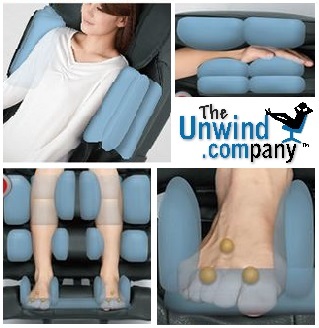 The latest in Air Bag Compressional Massage is employed in thie 4D PRO JP Massage Chair. Some of our friends and customers even call this the "Air Magic Massage". These airbags are designed with 3-5 levels of adjustability. They run from the top of your body all the way down to the soles of your feet. These are high-capacity air bags with a high-output. The arm bags can be set to 3 different settings to ensure an optimal comfort experience and the massaging bags in the shoulders, hips, waist, legs, and feet feature 5 levels of adjustability. These massaging air bags work in concert with each other to achieve total body relaxation and genuine relaxation that lasts. This, coupled with the reclining feature ensures you are sitting and resting in a natural posture that is conducive to optimal massage and enhanced well-being. The engineers at Osaki have intentionally designed the various regions of Air Compression Bags to work to increase ease of blood flow, rejuvenate muscles, and secure your body into the chair. These models are constantly being revised and improved from the addition of air bags, to the shiatsu massage balls underneath your feet, to the independent adjustability feautres. In addition to massage, this model features the ability to promote pelvic stretching and twisting. This has been shown to increase the optimization of well-being and overall health. The air bags around your hips operate in synchrony from reciprocal locations to provide a stretching and pulling motion. These effects can be noticed in your lower back as well as upper legs. The hip bags will then alternate to provide lifting and stretching on one side of the waist at a time to increase blood flow and ensure a safe and comfortable stretch. The air bags in the legs will work in conjunction with these to grasp and gently lower your legs while increasing pressure underneath your legs to provide a pronounced and comfortable stretch that you can notice immediately. At The Unwind Company, we strive for a Stress-Free Shopping Experience from start to finish. We employ a team of knowledgeable and dedicated Brand Specialists to ensure the smoothest shopping experience and ultimately to help you relax to the fullest. Please don't hesitate to drop us a line at 888-4-UNWIND for more details or to learn more about us.